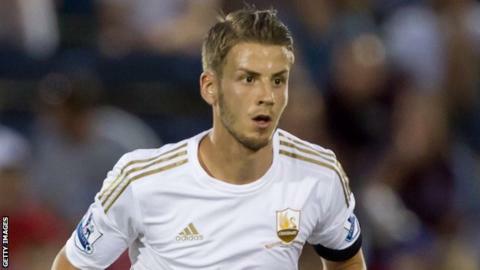 Brighton midfielder Andrea Orlandi says he has settled in quickly to the club following his deadline day move. The 28-year-old, who joined from Swansea, started his first game for the Seagulls in the 1-0 win over Watford. He told BBC Sussex: "At Swansea I didn't really feel part of the team. As soon as I came here, the feeling was really good straight away. "It wasn't my best game but I think I did well for the team. I'm delighted I could play my first game." Orlandi says Tuesday's victory at Vicarage Road was an important result for the side. "It was a really good win for us," he added. "Watford are a strong team and we didn't have the passing game we usually have in the second half. "The three points are crucial and it will give us a real boost in confidence." The Sussex club sit third in the Championship table after six games and Orlandi believes they are capable of mounting a sustained challenge for promotion. "The atmosphere and the togetherness in the dressing room is great," he continued. "This team is ready to be up there. When you win games where you haven't played well, that shows the character of the squad. "We won't get carried away. We have got experience in the team and know what we have to do."